Lose your heart to the mountains of Glencoe on this walk through some of the country's most spectacular upland scenery. Glencoe, with its craggy rugged mountains and sweeping passes, is one of the most scenic spots in Britain and its peaks attract thousands of walkers each year. This route does not rise to the heights of the many Munros in the area but weaves a course between two of the best known, Buachaille Etive Mor and its slightly smaller side-kick, Buachaille Etive Beag. A wide obvious path rises from the main A82 as it twists through the Pass of Glencoe, opposite a large stone memorial cairn built by the roadside. A green Scottish Right of Way Society sign for 'Glen Etive' marks the way. From the sign, the route climbs quite steeply at first but soon eases off as you leave the noise of traffic behind. Continue for half a mile until the path crosses the Allt Lairig Eilde. It then runs along above the burn. The route is obvious and, on the whole, solid. However, there are some boggy patches underfoot. Continue up the glen until the path crosses the burn once again. As the way rises up the glen it again crosses the burn and then a line of low cairns guide you to the col. Ahead the steep craggy north face of Stob Coire Sgreamhach dominates the view and there are a couple of spectacularly narrow waterfalls cascading down its slopes. Up to the left is Buachaille Etive Beag and the higher of its two summit, Stob Dubh. The path rises to its highest point at the col. 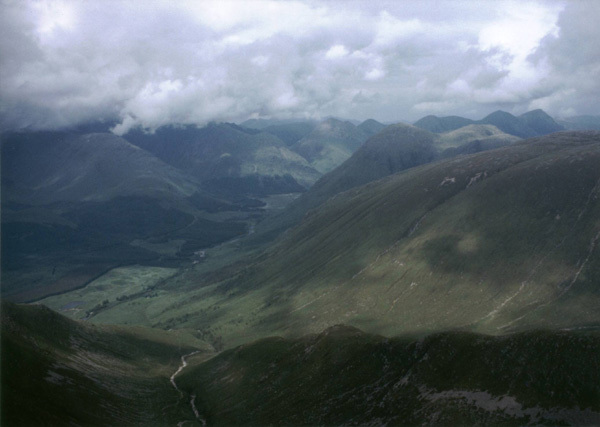 Here, views down to Glen Etive open out. To the south, the craggy summit of Ben Starav can be seen standing above the loch and in the glen below there are small farms and pockets of forestry. Once over the top, the route drops quickly, following the burn down down the glen. Descend for a mile towards Dalness and you will reach a junction with a path dropping down to the left to cross the burn below a small waterfall. Cross the burn and a narrow path cuts through the grass, skirting round the lower slope of Stob Dubh then climbs up into Lairig Gartain. The route follows the Allt Gartain closely and, although there is path throughout here, a spot of easy scrambling is required in one or two places. Here too are great views down Glen Etive. Pause briefly as you ascend to catch your breath and take in the stunning mountain scenery. Continue up until the highest point is reached. 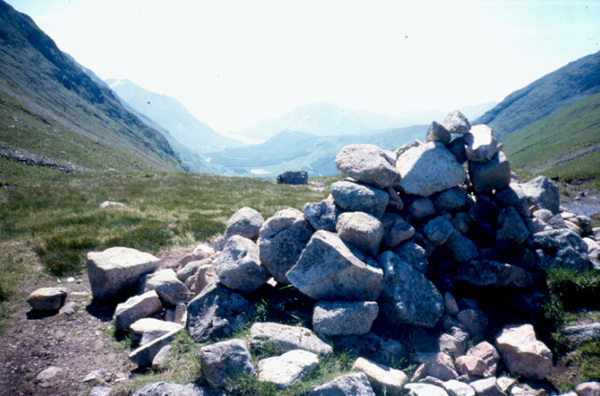 There is a large cairn on the col.
As you stand at the top looking north east, a wide, sweeping glen opens out before you, separating the large and small Buachaille Etives on either side. With Mor meaning large and beag translating as small in Gaelic, the remainder of the name means 'herdsmen of Etive'. The path, initially a bit boggy and indistinct in places, follows the burn down and after a long walk down eventually emerges on to the A82 at a large layby cut into the undulating terrain. Cross the road and on the far side pick up a path in the heather. Follow this west as it runs parallel to the main road. The way here is part of the old road through the glen. Continue west and a mile on the path rejoins the main road. The walk finishes back in the laybys although a short detour down to view the waterfalls is highly recommended. 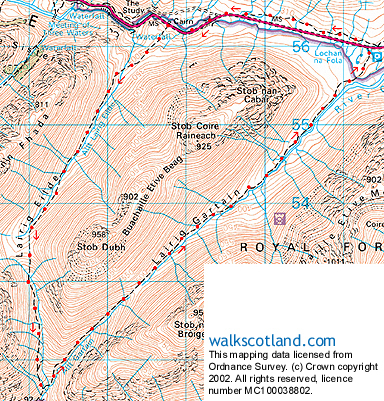 Start A82 road in Pass of Glencoe at grid ref NN 187563. Parking Large roadside laybys at and near start. Grading Obvious path through mountain glens. This walk is suitable for well equipped, fit walkers and older children. In winter Glencoe, even the mountain passes, can become inhospitable due to the weather. Sheep grazing so dogs on the lead.